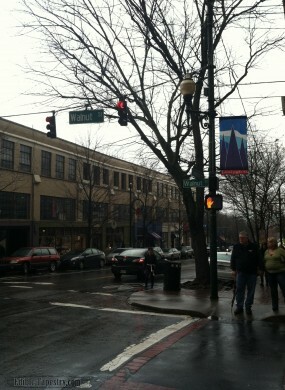 At the corner of Walnut and Lexington Avenue, within walking distance of…well…just everything in downtown Asheville, one finds The LAB. 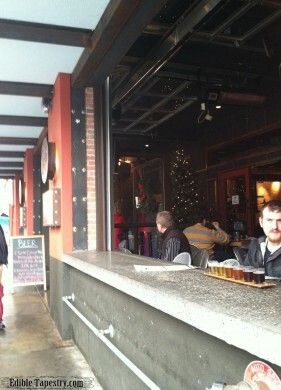 No coat or safety goggles required, just take a seat at the curved bar and settle in for a craft brew. Or sidle up to a larger table if you bring an entire crew, as I did. 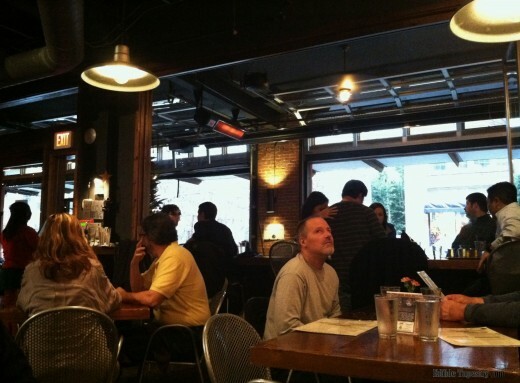 The church pew lined brick walls provide ample seating for large parties. Prefer outdoor seating? Even at the end of a long winter day you’ll find it at The LAB, if the mountain air hasn’t turned too frosty. 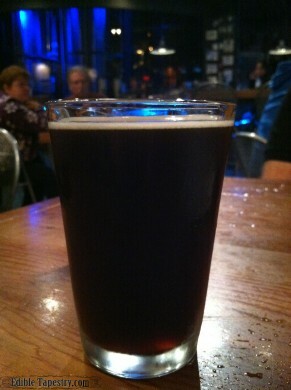 For this lightweight, a half pint Three Threads Porter, a chocolatey wheat malt, hit the spot. 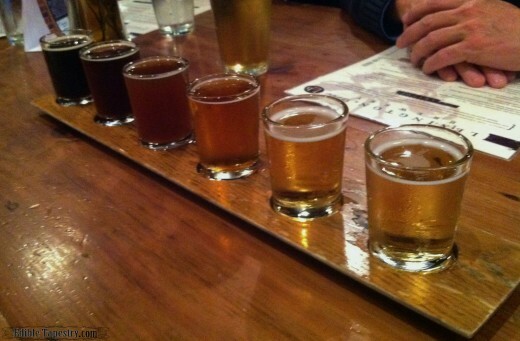 But for the true brew connoisseur, Lexington Avenue Brewery offers a flight of house-made beer. Six seasonal selections such as 1st Gear Cream, Lab Honey Wheat, Eleanor’s Rye, Ally Brown Ale, De Sint, or my Three Threads Porter. From almost every vantage point in the industrial themed building, a view of the large steel tanks that produce the establishments renowned pours can be seen. 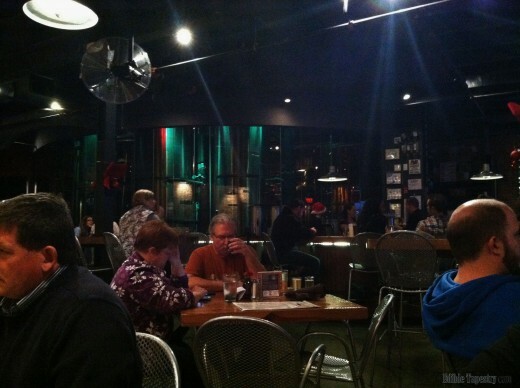 Toward the rear of the main room, a music venue hosts various talents on Friday and Saturday nights. Great stuff. But the formulas from The LAB that interest me most are the ones that come out of the kitchen. And the cooking crew does not disappoint, I especially learned the night I was lucky enough to join in the fun on the semi-final round of WNC Chefs Challenge, when the staff of Lexington Avenue Brewery competed. And what better combination to begin with than Truffled Pomme Frites? 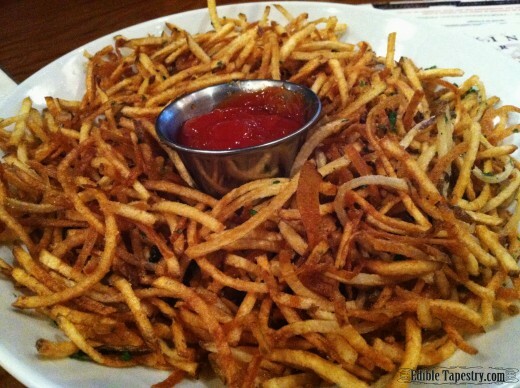 Shoestring potatoes fried crisp then tossed in truffle salt and fresh herbs, served with Tabasco ketchup. Yes. All in one big bowl. I had a few, took some pictures for my blog post, then looked down and they were GONE. That good. 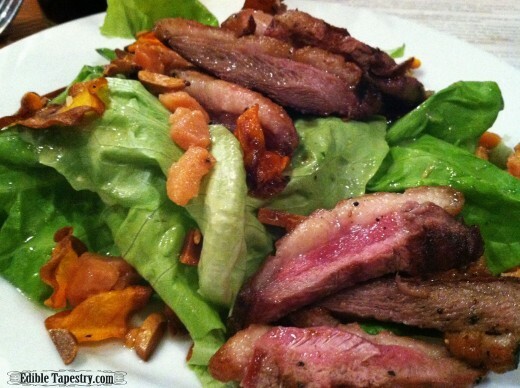 A salad of perfectly seared, glazed duck breast served over tender bib lettuce leaves with sesame toasted almonds, carrots, and a confit of quince was placed in front of me before I could mourn the frites I had missed out on. 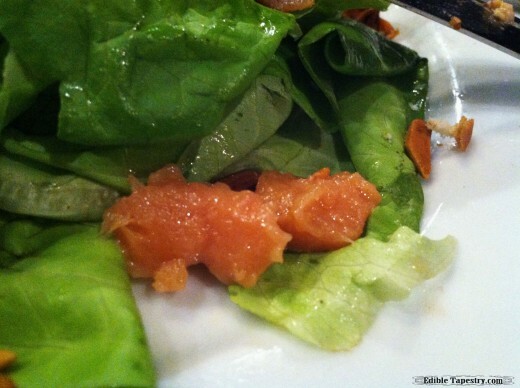 The symbiotic addition of lychee vinaigrette was enough to send me to the la la land of the foodie. I didn’t give those fries another thought. And I don’t even like lychee. 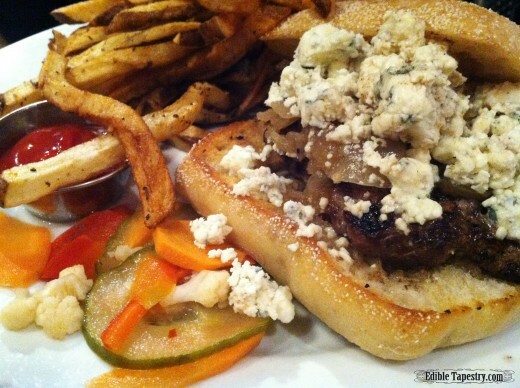 The LAB Burger is a mile-high tribute to culinary architecture. Made from the brewery’s own fresh Black Angus beef, the 1/2 lb. 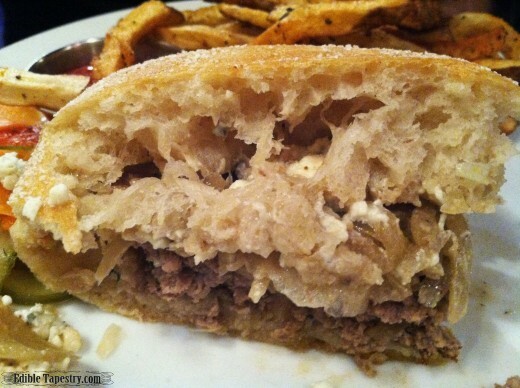 patty came padded with enough bleu cheese and caramelized onions to make this girl want to start dieting before the New Year’s resolutions had even been considered. The poivre sauce finished it, soaking into the spongy underside of a lofty artisan bun, ensuring that other condiments need not be added. The French Dip. Oh my. 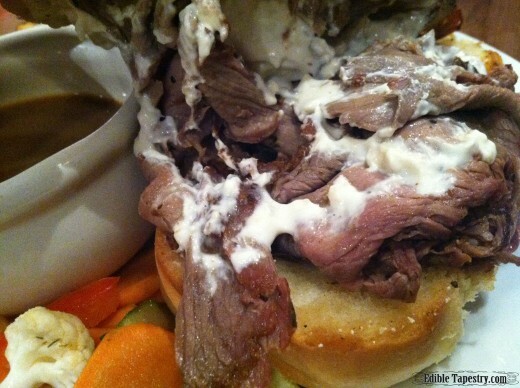 Also created from LAB’s own cattle, the thinly sliced sirloin is doused in horseradish sauce and served au jus for dipping. 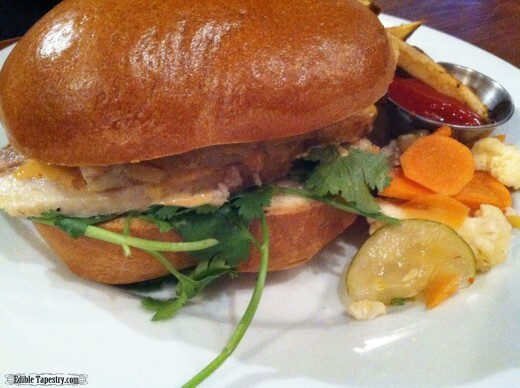 Sweet ponzu is the quintessential accent to the brewery’s braised pork belly sandwich. It is delivered to the guest decked with mint and a bold helping of cilantro, along with crispy pork rilletes and hoisin mayonnaise. It simply melts in the mouth. 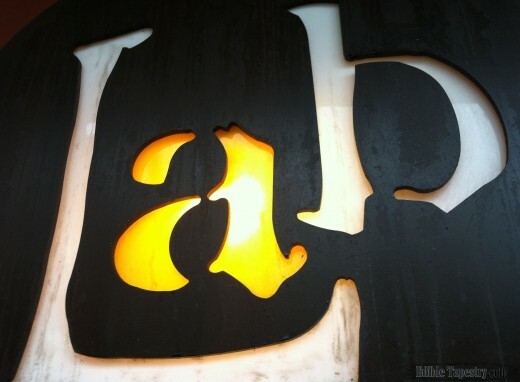 The LAB pickles, which are made from a variety of veggies, and hand-cut fries are served with sandwiches, though other sides are available, such as apple fennel risotto, garlic green beans, and whipped potatoes. 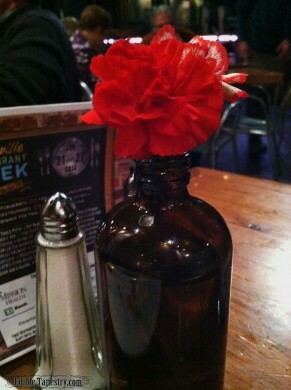 Fresh flowers on the table always make me smile. These look as if they rest in a used laboratory bottle. Mhm. 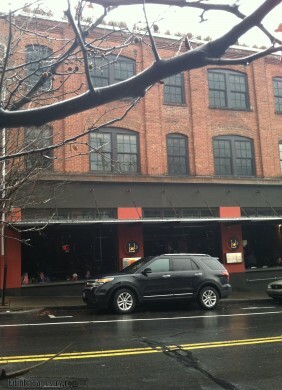 Down to the last detail at Lexington Avenue Brewery. 11:30 a.m. – 12:00 a.m.
11:30 a.m. – 2:00 a.m.